Hearty, healthy, hot soup is a fantastic way to chase away the winter cold! 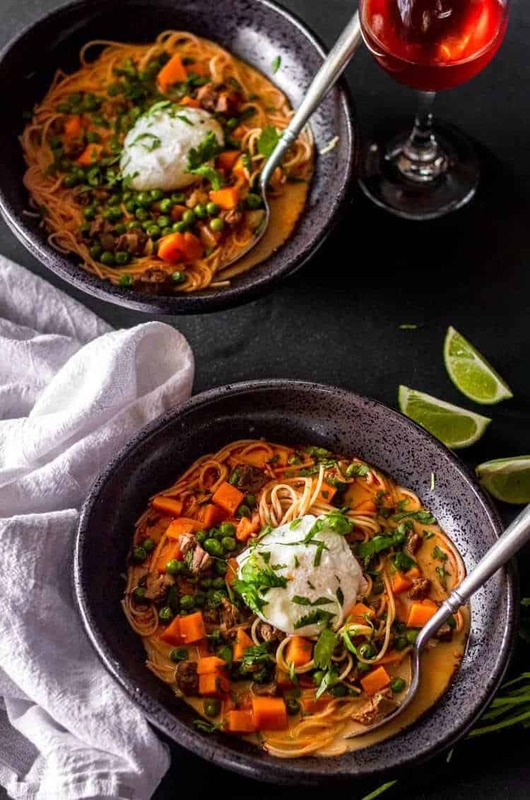 Peruvian Beef Noodle Soup (Sopa Criolla) with lean beef (ground or diced), angel hair pasta, and the tantalizing, subtle heat of aji panca is pure Peruvian comfort food and ready in half an hour! My June 2017 month in Peru undoubtedly intensified my interest in Peruvian food and flavors. The cultural influences – Incan, Indigenous, Asian, European – and the unique and varied ingredients – peppers, root vegetables, tropical produce, seafood, alpaca, cuy… – have been beautifully incorporated into one vibrant and eclectic cuisine. Peruvian food has become a culinary force, and with good reason! It is delicious. 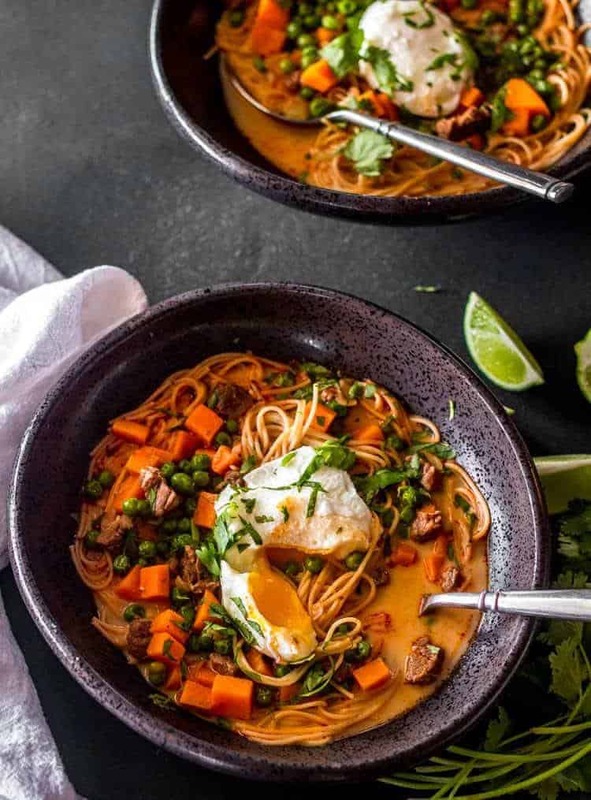 Peruvian Beef Noodle Soup (Sopa Criolla) reminds me of a good pot of homemade beef/vegetable/noodle or chicken noodle soup… nothing fancy, just wholesome, body-warming, comforting soup. The key ingredient in sopa criolla is aji panca. Peru is home to some pretty amazing peppers! 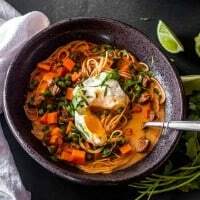 While they remain somewhat unknown outside the country, the increasing popularity of Peruvian food means they’re more widely available outside Peru. We saw/tasted many of them during our month in Peru. I will focus on the peppers that I keep in my well-stocked pantry, those available in my local markets. Aji amarillo was the first Peruvian pepper I experimented with in my cooking. 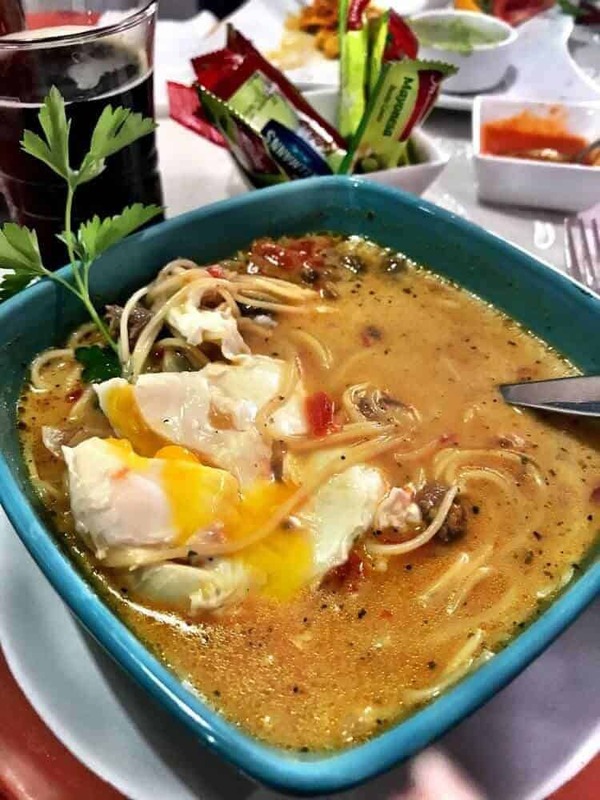 You may have tried one of Peru’s signature dishes, Aji de Gallina? This is a classic Peruvian dish – chicken with a creamy, spicy, nutty sauce served over rice. The aji amarillo is very apparent in its sunny yellow-hued sauce. Aji amarillo has an earthy, sun-kissed sweetness that reminds me of raisins. People may say aji amarillo is “so hot,” but this California-born New Mexican finds them to be quite mild! I would say they are on par with the jalapeño. I use aji amarillo in my Savory Plantain Pie and my Creamy Tomato Bisque Peruvian Style. Aji panca – featured in Peruvian Beef Noodle Soup (Sopa Criolla) – reminds me a bit of chipotle peppers. It has a more subtle but very present smoky flavor, and is deep red, mild, fruity, and slightly sweet. This tasty pepper is the key ingredient in Peruvian anticuchos (skewered beef hearts). By comparison, aji panca is milder than the jalapeño. Aji Rocoto may knock your socks off! This one is hot. This meaty, juicy pepper looks a bit like a red bell pepper, but the similarity ends there! The heat level varies, and may top out at habañero level spiciness. Proceed with caution. 😯 We enjoyed rocoto rellenos in Peru last summer – a spicy hot pepper stuffed with a savory meat mixture. I use them in my Grilled Rocoto and Bison Pizza, and my Roasted Sweet Potato and Giant Corn Peruvian Salad. I had sopa criolla a couple of times during our month in Peru. While the daytime temperatures were comfortable, the temperature dropped rapidly when the sun went down. Hot soup always sounded good. The typical pot of sopa criolla includes beef stock, ground or finely diced beef, aji panca, and angel hair pasta. The soft cooked egg on top is mandatory. I cannot resist a runny egg. EVER. I’ve mentioned before that my “go to” reference for Peruvian cooking is Peru Delights. Their version of Sopa Criolla seems pretty close to what I had in Peru. (See image below). In coming up with my North American version, I took a little bit of liberty with the traditional recipes. Peruvians use a lot of evaporated milk (which I despise!). I replace it with half n’ half or non-dairy coconut creamer. Peruvians eat very carb-heavy meals, and I’m more concerned with getting veggies into the dish. So, my version omits the potato found in many of the recipes, and the fried bread. I add diced sweet potato and petite peas. Most recipes call for a parsley garnish. Cilantro is a very typical Peruvian ingredient, and we prefer it in sopa criolla. You might prefer to substitute diced winter squash, green beans, etc. Lastly, I increase the typical amount of aji panca paste. As I mention above, we like heat. My suggestion if you’re uncertain is to start with a tablespoon, and add as desired. I hope you’ll find this quick and tasty soup as pleasing as we do! Put a pot of water with a palm full of salt on to boil for the pasta. To a dutch oven or deep pot, add the olive oil over medium-high heat. Add the beef. Cook until the beef is mostly brown (breaking it up if it's ground beef). Add the chopped onion and minced garlic. Continue to cook until the beef is gently browned, and onion is translucent. Add the aji panca paste, the tomato paste, and the sweet potato. Stir an additional 4-5 minutes. Add the stock and oregano leaves. Bring to a boil, then reduce to a simmer. Cover and cook until sweet potatoes are tender (7-10 minutes depending on size of dice). Cook pasta according to package instructions. While pasta cooks, add peas to the simmering soup. Cook your eggs. Stir in the half n' half or creamer. Reduce heat to warm. To serve: Add 1/4th of the angel hair to each bowl. Ladle the hot soup over. Use a fork to combine a bit. Top with an egg, and garnish with parsley or cilantro. Enjoy! The quickest way to make this soup is with ground beef. Occasionally I can get a tiny diced sirloin. We love it in sopa criolla. You can sub other ground meat (ie. turkey or chicken), but I would suggest switching to chicken stock also. Aji panca is pretty mild (milder than a mild jalapeño). I use 2-3 tablespoons in a pot of soup this size, and I get lots of flavor with mild heat that is definitely present. Adjust to your preferences. Macronutrients (approximation from MyFitnessPal.com): 634 calories; 46 g protein; 65 g carbohydrates; 20 g fat. Macros are based on 1 pound of 96/4 extra lean ground beef. Just like what I had in Peru. This sounds really yum. I’m going to try it when I round up the ahi paste. Toucan maybe? Toucan may have it! I found it in the Goya foods section of a Latino market in northwest El Paso once. Also, Amazon has many of the Peruvian pepper pastes... I hope you try it; it's one of our favorite soups! You can bet that I'll be making Evan Cook me this too! Sounds fantastic. Haha! This Sopa Criolla is a great work night meal because it's so quick to make! It's also cheap (which is also nice)... The aji panca is the only difficult ingredient, but hopefully Evan has a source for it! Let me know when you have it, and how you like it!